Greg worked as musical director with Jonathan Butler and also performed with Brian McKnight, Kirk Whalum, Will Downing, Richard Elliot, Gerald Albright, Chante Moore, Mindi Abair and Keb' Mo' just to mention a few. Greg's new album features Mindi Abair, André Berry, Patrick Bettison, Tom Evans, Keb' Mo', Jimmy Reid, Kirk Whalum and Terry Wollman among others. Greg wrote, arranged, mixed and produced all songs except Nick Of Time. The Calling starts with the fulminate Groovin' featuring attractive Mindi Abair in her prominent role as raising sax star. Mindi recently entered the charts with her new album In Hi-Fi Stereo (2010). Also on the party Columbia University graduated jazz vocalist Dawn Norfleet, who we'll certainly see again. Bonnie Raitt wrote Nick Of Time in 1989 for her same-titled album, her personal break-through. With great taste for fine music art Greg chooses this song for featured saxophonist Jimmy Reid. Greg's arrangement has thanks to Jimmy's emotional interpretation and the choir background a real Gospel flavor. The Calling presents Patrick Bettison on chromatic harmonica. If it is the harmonica, the bass or African percussion Patrick always impresses with his personal musical intensity. Yeke Yeke Yo is Greg's orchestral approach with influences of African percussion. Colorful and picturesque. On After The Rain guitarist Keb’ Mo', a living blues legend, showcases his bluesy finger style. Greg always tailors a perfect song for each presented musician. On It's Me Greg Manning displays his pleasant-sounding personality. Jimmy Reid, Tom Evans and Greg blend into a fine arrangement. The dynamic Shine A Light reveals another aspect of the musician Greg Manning. He is a supreme vocalist beside his excellent skills as keyboardist and programmer. With the cordial Mountain View Greg walks on the path of Dan Siegel, Jim Brickman and Richard Clayderman. Wayman is Greg's tribute to the late Wayman Tisdale featuring André Berry on lead bass. André plays Wayman's signature slap bass reminding at this great musician. “The guy was always so happy, so positive, always had a smile, always made you feel great,” recently commented Peter White. On Tribal Sphere Greg shows a jazzy excursion into world music and jazz fusion in the style of Joe Zawinul. Excellent sax and keyboard work! With the interlude Coming & Going Greg mirrors his thoughts on solo piano. The romantic ballade The Prayer unites Terry Wollman on acoustic guitar with Greg's piano performance. An awesome melody seamlessly played. The lazy moment of a sunny Sunday, Greg catch this mood in Sunday Morning. Final tune of this brilliant album is Home featuring sax legend Kirk Whalum, who will release a tribute album to Donny Hathaway next month. 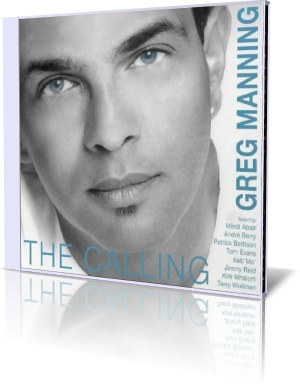 Greg Manning's The Calling shines brightly. Give this album a listen, it's without no doubt worth to spend some of your precious time.